This upcoming Monday, is, THE BIG ONE, it is Skilligalee week. Usually Mondays are dreaded, loathed and left for the dogs. But this Monday is different, it’s the beginning of the White Marlin Open and for many in and around OCMD it’s similar to Christmas morning. Monday morning anglers will set out from Harbour Island, Ocean City on an adventure: An adventure for treasure - The White Marlin. Known to be a rare and solitary species, it has been coveted by watermen since the Atlantic was the Atlantic. In the old days this beautiful creature was known as Skilligalee (say that word out loud and you’ll want one too). People have always sought after this sailfish, for its meat, for the story, the adventure, and now they will come to Ocean City, MD for the riches that it could bring. Last year’s prize money for the ‘World’s Largest Billfish Tournament’ was $2,770,000. There are a few ways to enjoy Ocean City’s White Marlin Open. One way to enjoy the tournament is to head down to the inlet and Harrison’s Harbor Watch Restaurant to watch the parade of boats. Harbor Watch has the best view in town and they supply us land folk tournament information and give insight to what all the different flags on the boats mean. Not to mention supplying Ocean City with the freshest seafood on the island. Want to have a more permanent location to watch the boats, check out the Oceanic Motel. Book a room overlooking the bay and watch the boats, day and night, as they travel to cash in on the Skilligalee! Even throw in a line yourself from the Oceanic’s lengthy fishing pier. By far, the most popular way to take the action in is to head down to the Harbour Island Marina on 14th Street and the Bay. There you can watch the big boats come in, witness the sea creatures being weighed and check out the vendors. There’s always a festival atmosphere going on down there and usually the town provides a shuttle from the convention center to the harbor. The best way to get into the action is simply entering the tournament. You’ll need a boat. A big boat. Think JAWS big. And then think, ‘We’re gonna need a bigger boat.’ For those that do enter, good luck! For those that are not going to enter the tournament and want to enjoy the town fishing, there are quite a few options for you as well. The bulkhead at 2nd thru 4th Street is a free fishing zone; you can fish without a license here. You still need to be part of a registry (call 855-855-3906). Keeper flounder can be found there with a slacking tide. 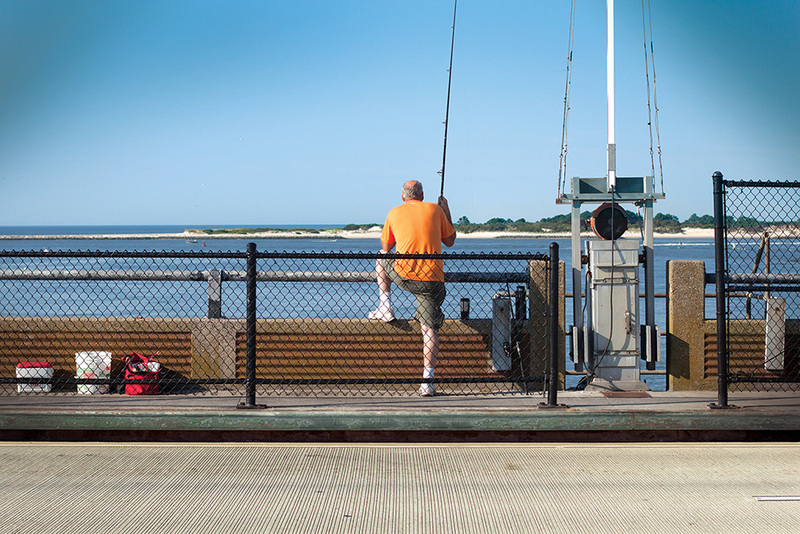 Anglers can also find sea bass, rock, spot, croaker, bluefish, tautog, and puppy drum. If the tides moving hard, cast straight down, it’s deep enough and you won’t get hung up. The OC Pier is another spot you can fish without a MD license. The Route 50 Bridge coming into Ocean City is also a hotspot for anglers. You’ll need a MD License to fish off of the 50 Bridge, which are reasonably priced. So remember, you don’t need a big fancy boat to hook a nice fish in Ocean City, MD. Good luck and have fun, Monday is almost here!